This sheet is an impressive debut for Thundercals. As well as being top quality in the research and presentation, the markings for these two aircraft have not been provided in decal form before. This is the second sheet of the initial two releases from the new decal company, Thundercals. 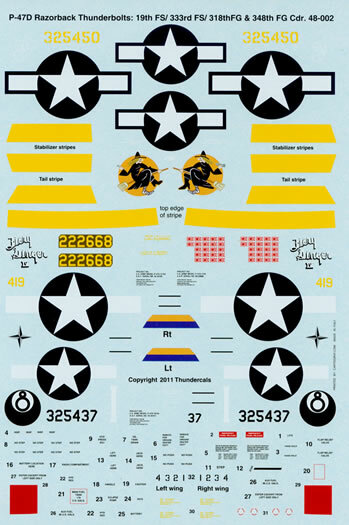 This sheet too carries markings for Pacific Theatre based Republic P-47D Thunderbolts. “The Witch” P-47D-21-RA, serial number 43-25450 which was assigned to the 333rd Fighter Squadron, 318th Fighter Group, 7th Fighter Command. The markings depict the machine when it was flown from Hawaii’s Wheeler Field by Lieutenant Durwood Williams in April, 1944. It is in the standard factory applied olive drab over neutral grey camouflage scheme and wears yellow wing tips, spinner dome, 12" bands around the mid-fuselage, vertical and horizontal stabilisers. The front of the engine cowling is painted yellow as well. Decals are provided for the bands but you will have to paint the cowling front, wing tips and the spinner dome yourself. Unlike the previous sheet, no suggested match to the shade of the yellow is provided. Nose art in the form of a broom riding witch on a yellow circle background. The pilot’s name is worn under the canopy in white on both sides of the fuselage. The aircraft’s serial number is worn on the vertical stabiliser in yellow and the “last three” of the aircraft’s serial number is worn on the lower lip of the front of the engine cowling in white numerals. The wheel covers sport a pair of white outline dice and the sliding portion of the canopy rails are painted black. “Fiery Ginger IV” P-47D-4-RA 42-22668 flown by Colonel Neel Kearby, the Commanding Officer of the 5th Fighter Command 5th Air Force from the Saidor Strip, New Guinea in March 1944. It is painted in olive drab and neutral grey and wears South West Pacific theatre markings comprising a white vertical stabiliser/rudder and leading edges to its wings. It sports a natural metal spinner dome and the tip of its tail is painted with thin red, yellow and blue bands (the colours representing each of the squadrons that made up the 348th fighter Group – red for the 340th Fighter Squadron, yellow for the 341st and blue for the 342nd Fighter Squadron) this marking is provided as a blue and yellow decal which requires you to first paint the tip of the vertical stabiliser red and then place the blue and yellow decal with to complete the marking. The serial number is yellow on an olive drab background on the vertical stabiliser and Thundercals have thoughtfully provided this as a one-part decal so you don’t need to mess around with fiddly masking. Three different scoreboards are provided for this option, a pair with 22 victories on the main sheet and one with 21 victories on a small errata sheet. My understanding is that Colonel Kearby was shot down immediately after downing his 22nd confirmed kill. Some sources say that the machine carried 22 victory markings when it was shot down and that the 22nd victory that was put on the scoreboard was thought to be a “probable” that Colonel Kearby shot down in December 1943. The name “Fiery Ginger” is worn on the both sides of the cowling in white (with black shadowing) and the pilot’s and crew chief and assistant crew chief’s names are in yellow are on the canopy rail and the underside of the canopy respectively. “8 Ball” P-47D-20-RA 43-25437 of the 19th Fighter Squadron, 318th Fighter Group, 7th Air Force. The markings depict the machine when it was flown by a Lieutenant “Blackjack” Elender from Aslito (Isley) Field on Saipan Island in the June of 1944. The aircraft is in the standard factory applied olive drab over neutral grey camouflage scheme but sports bare metal vertical and horizontal stabilisers and engine cowling. It also sports a blue spinner dome wing tips, and 12" wide bands around the vertical and horizontal stabilisers. Unlike the first option, no decals are provided for the bands so you will have to paint these on yourself. Other supplied markings include the nose art ( a pair of eight balls), the plane in squadron identifying letter (I), the pilot’s name in white, black numerals 37 for the front of the intake, and the serial number for the vertical stabiliser (in black). The placement guide is A-4 in size and provides large colour port side profiles of each machine as well as generic line drawings of the upper and lower surfaces. The guide also holds fairly comprehensive notes on each aircraft as well as guidance on what propellers were fitted to each machine and whether or not it was fitted with wheel covers or not. The notes for the “Fiery Ginger” option are particularly complete. 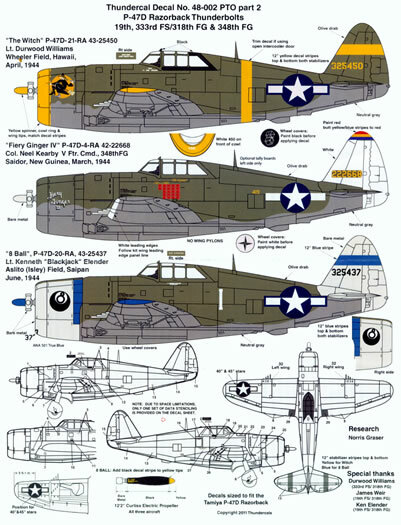 Modelling notes are also carried and they advise that decals are “sized” for the Tamiya kit but will fit any 1/48 scale P-47D Razorback kit “with minimal adjustment”. A list of references is also carried on the sheet. The decals themselves have been printed by Cartograf. They are thin with a minimal carrier film and everything on my sheet is in perfect register. Two sets of national insignia are provided. 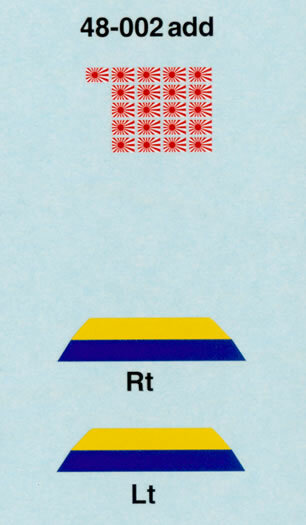 A set of “blue bordered” ones for the first and third options as well as a set of modified post July 1943 ones with white bars only for the “Fiery Ginger” option. A single and very comprehensive set of stencil data is provided. There are two sheets with this one. A normal sized one and a small errata sheet. 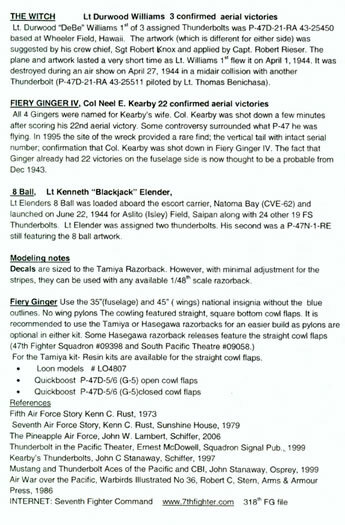 The errata sheet carries the aforementioned scoreboard for “Fiery Ginger” and a pair of tail tip markings for the same option – the ones on the main sheet have the yellow in a darker, incorrect shade. The decal sheet and the two placement guides come packed in a clear plastic zip-loc bag. This is a great follow up sheet from Thundercals. 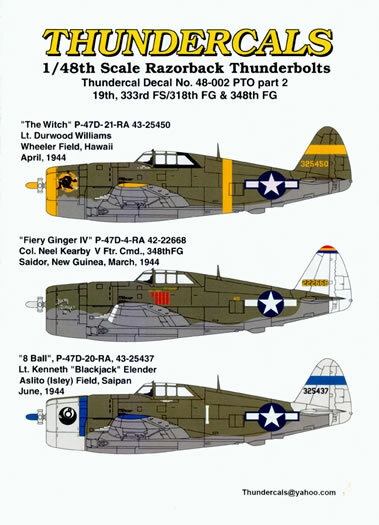 It provides you with excellent quality decals and well researched information for the often overlooked early P-47s that were operated in the Pacific Theatre. Whilst the “Firey Ginger” option has been seen in decal form previously, the other two options have not.